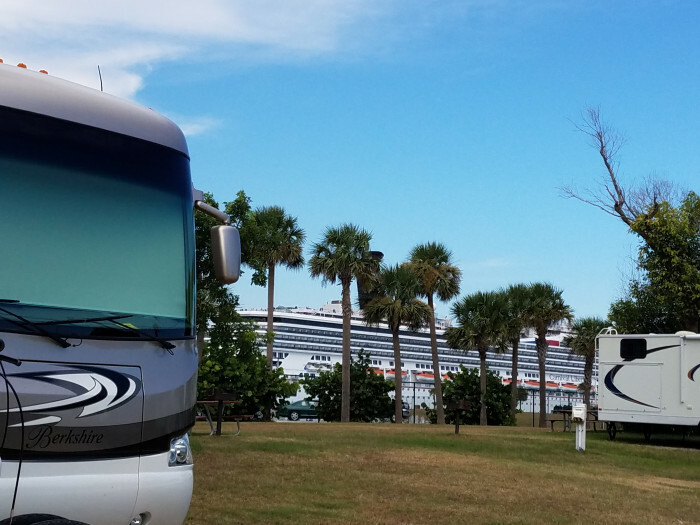 Ask fellow campers about "Jetty Park Campground" and nearby attractions. This campground is hard to rate. I gave it a 7 because there is no cable and the WiFi was sporadic at the best. The sites are fairly close together with some being a concrete pad and others sand or gravel. Our 42 ft fifth wheel fit only by backing up to the fence. There was minimal shade from a large tree at the front of the site. if you do not need 50 amp service, the sites 100-110 are large and you can see ship action from those. Now, I would give it a 10 for location. The campground is perfect for viewing a launch from Cape Canaveral. Walk out any of the gates and you can be on the beach, fish from the park or the jetty. Take your beach cart and you are set. Campers have 24 hour access to the beach, etc. while day visitors must leave by 11PM. There is good dog walking and those areas were clean. Watching the cruise ships leave from port was an added bonus. We will definitely be back once the snowbirds have departed. We camped at Jetty Park Campground in a Fifth Wheel. The Exploration tower is close and is a great way to start if going to NASA. Several restaurants not far from the campground. Check out Parker Brothers and the Merritt Island and Canaveral National Seashore. Stayed in Spot # 321, full hookups with a concrete pad. Very little shade, which was OK as we used a satellite dish on the roof of the coach. Park was clean and very nice. We camped at Jetty Park Campground in a Motorhome. We stayed here for a week. The beach is right next to the campground, and cruise ships sail past periodically (an amazing sight). The spot had plenty of room, but maneuvering in a big rig can get tricky through some of the narrow streets (but still manageable). Verizon coverage was good. The staff were friendly, and accepted mail/packages for us. The grounds were a little overgrown, and landscaping did not seem to be a priority. Kennedy Space Center is nearby, as is a twice-daily casino cruise (practically within walking distance of the park...definitely bikeable). Dogs are not allowed on the beach, but there were plenty of places to walk within the campground. There is no dog park or similar amenity. We would stay again, especially if there happens to be a launch. We camped at Jetty Park Campground in a Fifth Wheel. Check out The Cove for a handful of restaurants and bars, with fresh fish and lively music. Great campground. We stayed on 108 which is on the fenced side of the Inlet. Which we had been on 107 or 109 as then the water hookup would have been on correct side of RV. All even lots on this lane you have to run water hose under the RV to reach. Not a huge deal, but inconvenient. All sites on this side of the lane are very spacious. Fishing Pier and Beach within walking. Very friendly staff. We camped at Jetty Park Campground in a Motorhome. Kennedy Space Center is a great attraction. Beach and Fishing Pier right at campground are very nice. Best part was that you were steps to the beach. No shade at our site 316 but location was great, door through gate steps away which lead to the beach. Concrete pad, backed up to gate and road in front of us. Plenty of room for our 40'. Center of campground absolutely no shade and literally right on top of each other. Close to downtown and port Canaveral. Was worth getting up at 430am to watch cruise ships come in. We camped at Jetty Park Campground in a Motorhome. You can't bring tow dolly with you to all sites. Picnic tables are old and need replacement. You need to bring your own fire ring. Check the requirements. 4 miles to town to Publix and restaurants. Our 50 amp, FHU, back-in site was on a concrete slab and was level. Our site #352 was shaded, as were our friends' sites-#357 & #358. Not all sites have shade. I called before booking online to get insight from the CG as to shaded sites. There was ample space between our sites. CG is clean, well run, and check-in was efficient and friendly. The beach is a short walk away as is the pier. The port where cruise ships depart is nearby. There is a breakfast/lunch restaurant at the pier. More restaurants are a short drive away by car or bike. Lots of biking and walking space. Their WIFI was non existent, but we have our own hotspot, so no problem for us. We had plenty of OTA channels and good Verizon cell service. We'll definitely be back. We loved it here. 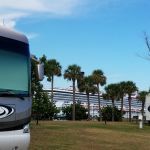 We camped at Jetty Park Campground in a Motorhome. FHU 50 amp back-in site. 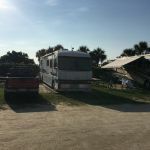 No shade on this one, RV behind us did not allow us to fully utilize our pad due to his overhang but managed to level the coach anyway. Approx. 55 OTA TV channels mainly from Orlando. WIFI worked fine this time around. Plenty of activity this year, 2 launches off the Cape (one 1st rocket returned for landing), submarine in/out of the channel directly across from campground and of course, the many cruise ships and cargo vessels who use the port daily. We camped at Jetty Park Campground in a Motorhome. Beach very close. Fishing pier is partially open (still recovering from hurricane damage), Orlando with all it's attractions within 1 hour drive. Many restaurants nearby. Boat ramp adjacent to the park. Plenty to do here folks......have fun! Tight spots but great location! We camped at Jetty Park Campground in a Motorhome. First time here. We had to pay the higher price since we were out of Brevard County--high price $40 a night. Found our campsite unsatisfactory - no pad, out of level, water a considerable distance from the other hook-ups. Very much disappointed the campsites are not good, nor is the campground a "nice" place. We did, however, love the channel entertainment of ships, the pier is pretty good for fishing but the jetty is not due to rocks. The beach is ok but is very shallow and you are not allowed to fish from it. We camped at Jetty Park Campground in a Travel Trailer. Had a good seafood lunch at the Baja Chowder house at The Cove (outside the park). Be sure and walk around The Cove - interesting views. Shopping is close by as is fuel. If you just want to see the ships come and go (we saw a submarine and more) go to the launch ramp just outside the park. You can sit or fish there. Not much shade. Stay away from sites near tent camping. The east side of the park is closer to the beach but the sites are pretty cramped. While many are shadier you need to be careful with slides and awnings. Wifi is virtually nonexistent. Nice beach and fishing pier. Dogs are only allowed in the camping area. Not allowed at beach, pier or near the inlet. We were in site 100. It backs up to the maintenance area and there is a security light there that stays on all night. We faced the inlet and although there was a fence we could see the cruise ships coming in and out of the inlet. We camped at Jetty Park Campground in a Travel Trailer. Bring your fishing poles and bikes! Some sites require extra long sewer extensions. Very nice and clean campground. Friendly staff at check-in. Not every site is the same. Some have all hookups, others may lack sewer and/or 50amp power. Be careful to the details of each site when you book. We camped at Jetty Park Campground in a Motorhome. Grocery stores available in Cocoa Beach, or across the barrier islands on the mainland. This was our third time to stay at Jetty Park. One of the reasons we keep coming back is location, location, location. 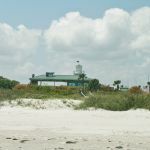 Jetty Park is close to the beach, fishing pier, cruise terminal and some very good places to eat; all within walking or biking distance of the campground. Our campsite consisted of a concrete pad for the MH to be placed on and a sand/grass area for the "patio" area. Some shade but we were close to our neighbors. Several good places to eat nearby: Fishlips, Grills, and a new found local watering hole by the name of "Sandbar." Some of the locals recommended it. Possibly some of the best fish tacos I've ever had. It's about 1 block east of Ron Jons right on the beach. The other reason we return is because of the incredibly helpful office staff. They were also an immense help when it came time to making reservations. My hat is off to them! We camped at Jetty Park Campground in a Motorhome. 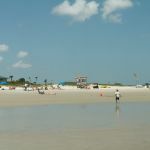 watch the cruise ships depart between 4 and 5 PM, ride bicycles to Manatee park (about 7 miles round trip), ride bicycles to Fishlips or Grills for lunch/dinner (about 2 miles roundtrip) and ride your bicycle to the Cocoa Beach pier. (about 8 miles roundtrip). It's all flat with no hills. Easy in and out of site. This section sites are very close. Staff very friendly. Nice views of cruise ships leaving port. We camped at Jetty Park Campground in a Travel Trailer. Casino cruise was a nice day trip. Stayed here for New Years weekend and had a great time. Been here many times. Staff was awesome, we are in a 43 foot rig and site 356 they gave us had a lot of shade which is great but also meant a bunch of branches. I got out and hand trimmed a bunch of branches but was still concerned with a few big boys as a windy forecast loomed. I went to office and reported this thinking i would get action the next day as the hour was getting late. They came out that night with lights and ladders and trimmed the branch that night !!! The only thing about the campground that I didn't care for is the WIFI - it stunk ! 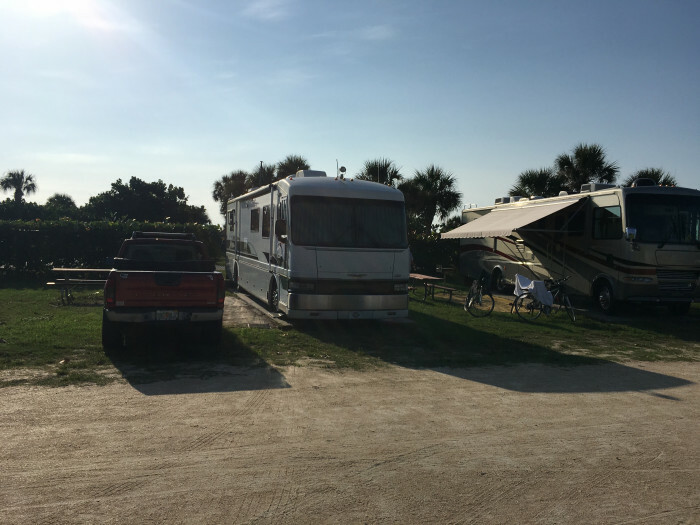 We camped at Jetty Park Campground in a Motorhome. Shopping in Cocoa, gambling on the ship daily if that is your thing, fishing, boating, beach. Easy to get in and out.Very well maintained. But watch out for the sand spurs - leave your shoes outside. Storms can be sudden and harsh so I pulled the awning in when not there and at night even though it was tied down. Beach and fishing pier are within walking distance. There is a camp store in the main campground (a good hike from the waterfront spaces) and a bait shop in the Port area, which warrants a drive or a bicycle at the least. Grills restaurant in the Port does have a nice Sunday brunch. Beautiful area. Plenty of shopping and water sports available. Close to cruise ship docks so you can watch large ships come and go. Large state park play ground and picnic area next door but no one was there during our stay. Beach is walking distance and has restrooms, snack bar, inside eating and life guards on duty. Beach is white (sugar sand). Kennedy Space Center 12 mile area. Good for all day trip. Bring your own portable fire pit -- like many Florida state/county parks on the beach, fires are only allowed in contained units that you bring. For good seafood, both Fishlips and Grills are good choices. There was also a "Seafood Festival" during the weekend we were there. Many many choices of local seafood were available. The beach, Cape Canaveral, the Kennedy Space Center, a free fishing pier, nice bike trails, many restaurants close. Went to Fish Lips for dinner and the food was very good. Also it is very near the Disney line and others, so you can watch the ships go out from the patio while you eat. Port Canaveral has some nice restaurants and views of the cruise ships. While the park was "OK" I wasn't particularly thrilled with Cape Canaveral area south of the park, nor the immediate towns in close proximity. I didn't find the cruise ship terminals which you drive through to get to Jetty Park as an attraction. The area simply felt very industrial nearly like an industrial port. NASA's Kennedy Space Center and Canaveral National Seashore are very close, just across the channel. But don't be fooled by a map. You must drive to the open areas of locations as much of the areas are governmental restricted. NASA was an incredible visit and the National Seashore a perfect 10 natal area beach unlike any other i have ever visited. Watching rocket fired from the cape. Great spot to base out of to see the sights of the space coast. Cape Canaveral is close by. Kennedy Space Center is a must see since the space shuttle program was closed. Grills restaurant and other "port" restaurants very close. Down A1A close by are dozens more. Kennedy Space Center is only minutes away and a great experience. Beach is wonderful. Victory casino cruise is very close, can walk there or shuttle. Madd Jacks Grillin Shack (just a short drive) has excellent BBQ, the beef was very good, the pulled pork was The Best Ever! Are you affiliated with Jetty Park Campground ?